I am so excited to be bringing you all a brand new blogger series “From Summer to Fall,” this series is all about transitioning some of our favorite Summer trends you may or may not already have in your closet to Fall favorites. And guess what?! 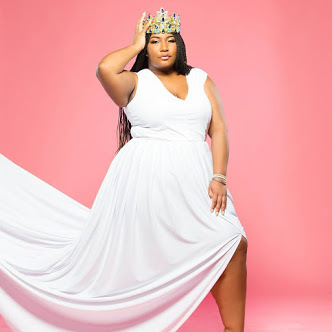 I am bringing some of my favorite local bloggers along with me Belinda of The Honey Bee 901, Desiree of Mocha Divas, and Komal of Komal Means Delicate, Erica of Erica Dallas, Melissa of Reverberating Daily, and Michelle of Elaine Michelle. Floral is always a good idea. 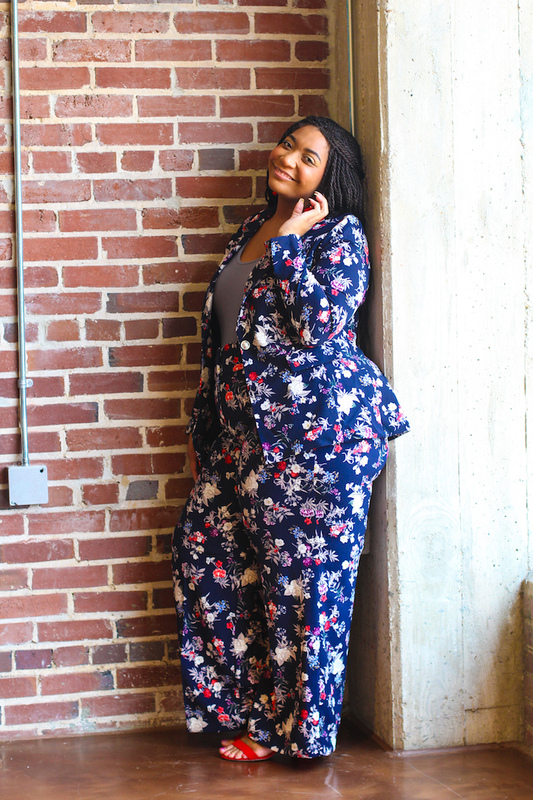 But to wear a floral suit is giving me all of the Beyonce “Love On Top,” vibes. This is one of those items I could not see myself in, I kept walking past it in the store and was drawn to it. 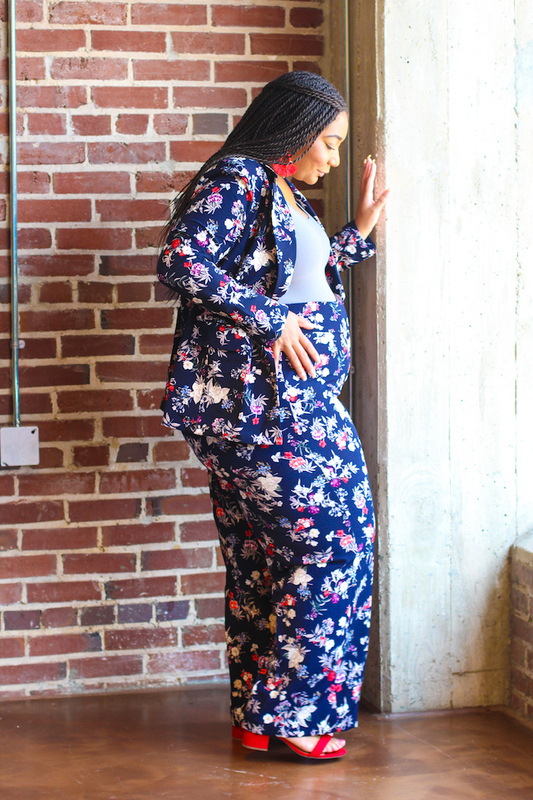 Then, I took this suit to the dressing room still not convinced, especially considering the bottoms were not maternity. To my suprise, I loved it!!! 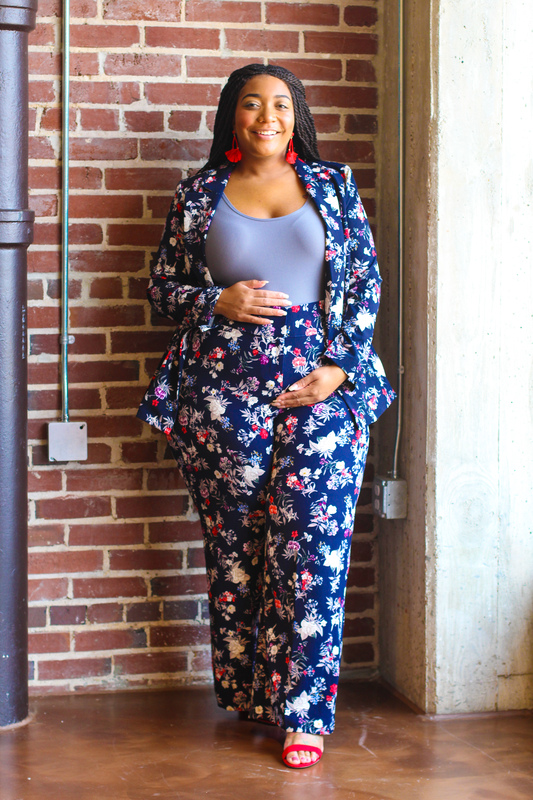 The pants have stretch paneling which makes it comfy for my growing baby bump and the blazer has a zipper in the back making closing it comfortable. 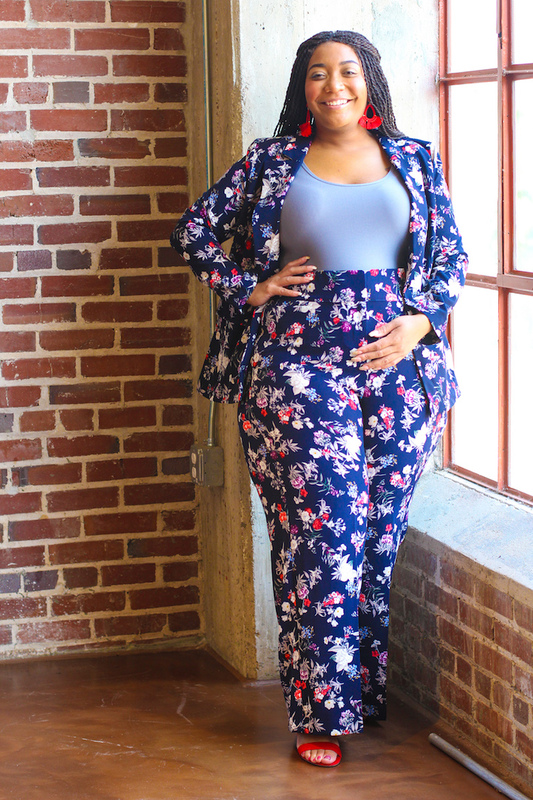 Now, lets talk about styling a floral power suit. 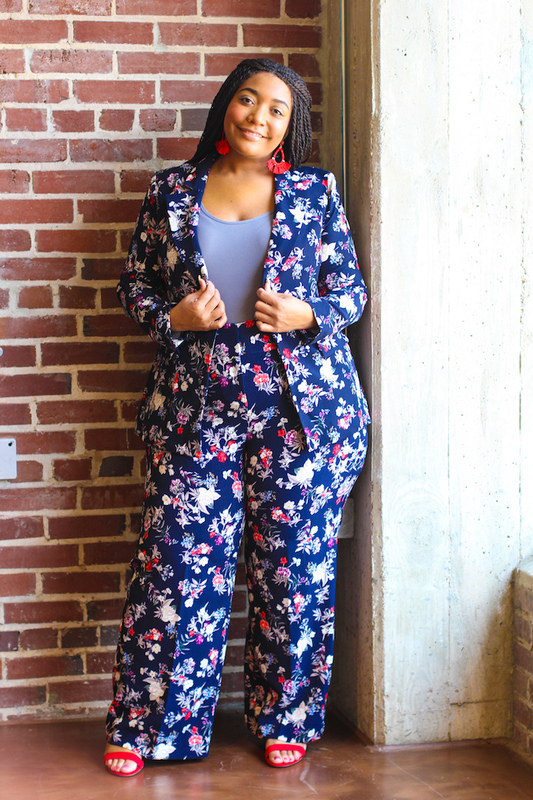 Now with such a printed suit you can either go the black route, where you pair a white tank, black shoes, and simple earrings, however I wanted a color overload. I went with a grey tank top, accentuating the grey in the suit. 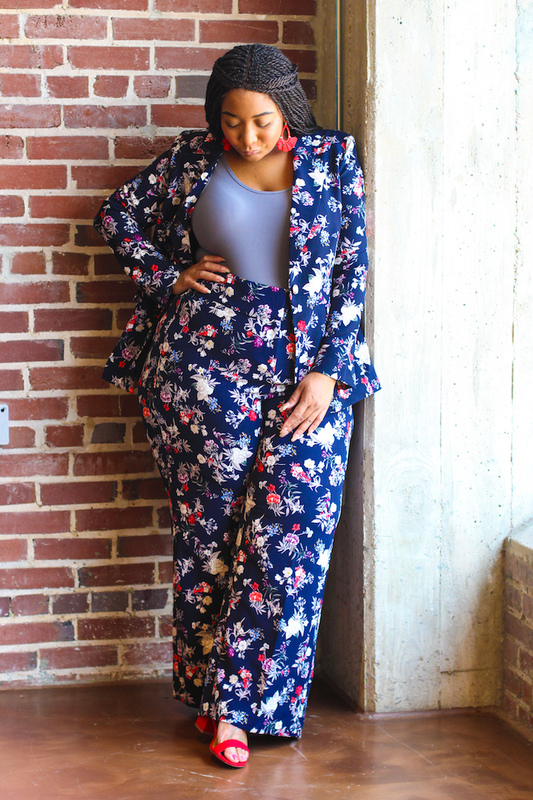 I opted for red block heels and red earrings (similar) to make this suit pop. I am still excited about this suit! I will be wearing it at least 2 other ways. Be sure to check out all of the other bloggers for some Fall floral inspiration. 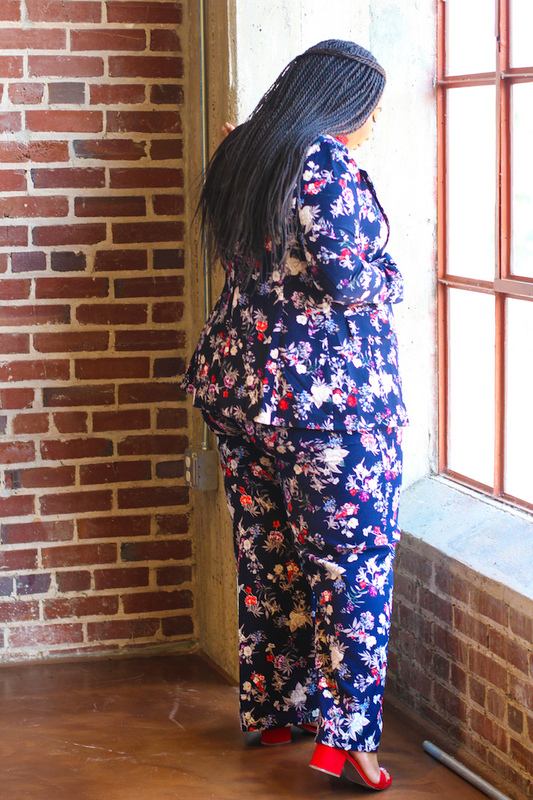 Style Notes: I am wearing a size 16 in the blazer. My pants are a 20, I sized up to be more comfortable with a growing belly bump. My grey tank top is an extra large and I sized up. My red block heel sandals are true to size in a 10.